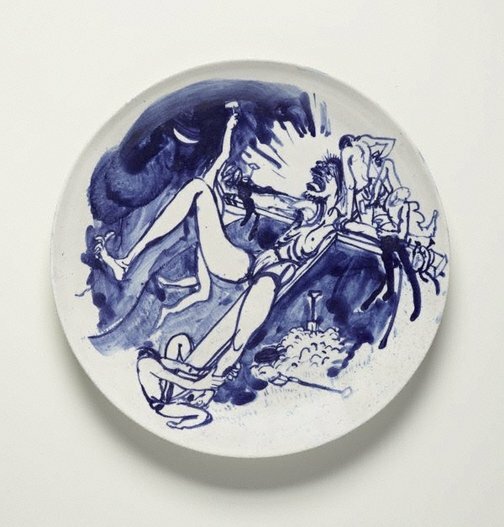 From the mid 1970s Brett Whiteley collaborated with a number of Australian artist-potters, including Derek Smith and John Dellow, producing a variety of vases, plates and other ceramic vessels, drawn with calligraphic gestures in blue glaze over a white porcelain background. In these images, Whiteley depicted blossoms, trees, birds and other animals, lovers, as well as a series on the theme of the Crucifixion. This plate corresponds with a series of paintings and drawings produced in 1979–80 where the tortured figure of Christ is laid bare on the Cross, distended and malformed hands and fingers pierced with both drawn and real iron nails. Signed and dated upper verso, blue glaze “brett/ whiteley/ 89”.